Tag line: "From the creators of the award-winning film Baraka"
From director Ron Fricke, the creative mind behind the groundbreaking documentaries Chronos and Baraka, comes yet another visual explosion, 2011’s Samsara, a movie that spans the globe to capture images of life, death, and everything in-between. 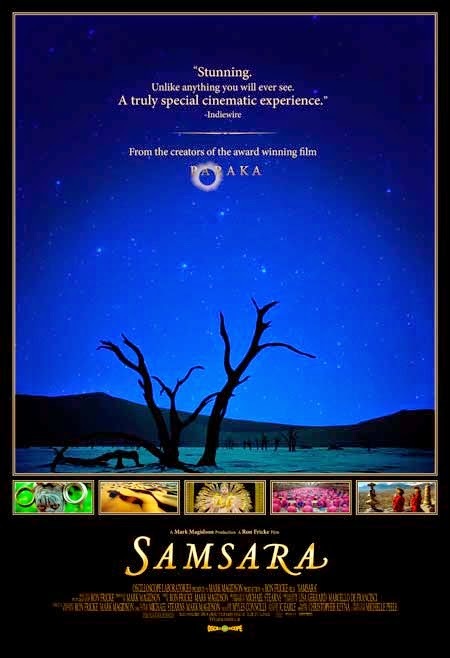 Samsara (which in Sanskrit means “continuous flow”) was filmed over the course of four years, during which time Fricke and his crew visited 5 continents, capturing breathtaking images of the natural world (like the Epupa Falls in Angola, Africa) as well as some of mankind’s greatest achievements (a brief sequence in Cairo provides us with a glimpse of the Pyramids at Giza). With stops in Beijing (where we witness an impressive parade), Jerusalem (to visit the Wailing Wall), and even Arlington National Cemetery, Samsara explores the circle of life in a number of fascinating ways (the baptism of several babies is quickly followed by a trip to the Catacombe dei Cappuccini in Palermo, Italy, where the preserved body of young Rosalia Lombardo, a two-year old girl who died of pneumonia in 1920, lies in a glass-covered coffin). The film's examination of death expands beyond the human world to include animals (by way of visits to a chicken farm and a meat-packing plant) and even entire communities (some of the film’s most moving imagery is that of New Orleans’ Ninth Ward, where we see first-hand the devastation caused by 2005’s Hurricane Katrina), yet Samsara also acts as a celebration of life, introducing us to the exotic ballet of the Balinese Tari Legong Dancers and wowing us with an incredible exhibition staged by the students of the Tagou Martial Arts School in Zhengzhou, China, sequences as awesome as any natural wonder the movie has to offer. Shot on 70mm, Samsara, like Chronos and Baraka before it, acts as a window to the world, through which we see many interesting things. Awe-inspiring and occasionally shocking, Samsara is guaranteed to blow you away.